As I straighten out issues with my server/domain name. It should hopefully fix itself any minute now. I promise I’m not going anywhere yet! The Vosges Haut Chocolat boutique was at the top of my list of candy places to hit up in Vegas (though it was a short list; Ethel’s Chocolate Lounge was the only other place on there). The flagship Whole Foods in Austin carries several Vosges bars (BUY!) 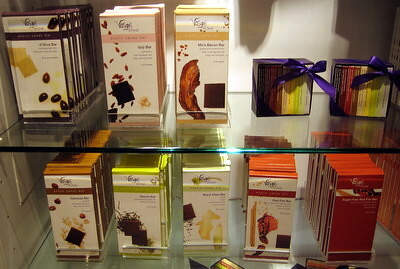 and small prepicked boxes of their truffles, but I wanted to see an actual Vosges boutique in all of its chocolate glory. I visited the one in Caesar’s Palace’s Forum Shops with my mother on Christmas day, and she generously offered to buy me whatever I wanted as my Christmas gift. The boutique was prettily laid out, with lots of clean spaces, glass shelving, and accented displays. There’s also a chocolate bar in the back, where you can buy sipping chocolate and giant cookies the size of my outstretched hand. 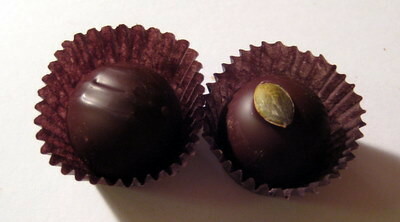 I chose the assortment of mini-bars seen above in the top right corner (I’d known I wanted to buy those since I started planning my trip to the boutique) and picked out two of their truffles, the Tlan Nacu (below photo, left) and the Lion (below photo, right), for my Christmas present. The Vosges employee helping me put them in a pretty white box that he then tied with a purple satin ribbon (like the ones in this photo). I appreciated the decorative touch, as later chocolatiers I visited put my individually purchased truffles in paper or cellophane bags, which were far less pretty. 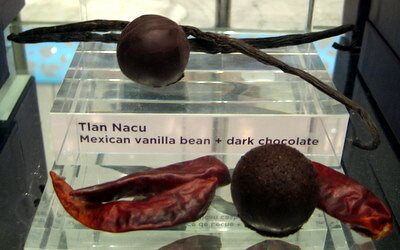 The Tlan Nacu, described by Vosges as Mexican vanilla bean + dark chocolate, had an incredibly creamy ganache with a sweet tinge to its aftertaste. Otherwise, though, it pretty much tasted like a softened dark chocolate, which is basically what you get when you add vanilla to chocolate. I couldn’t remember what was in the Lion truffle, so the ingredient list couldn’t influence my tasting notes. I got a very slight chili heat that reminded me of a chocolate chipotle gelato I had a Viva Chocolato. In the truffle, it’s more of a suggestion of that peppery, spicy heat without any actual fire. I also got some slight fruity notes in the aftertaste. 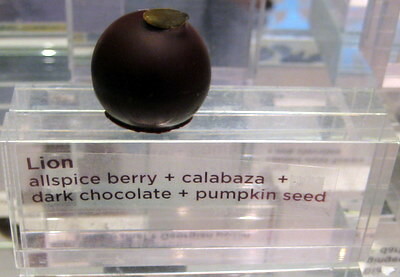 Revisiting my photos reveals that the Lion is allspice berry, calabaza, dark chocolate, and pumpkin seed. The pumpkin seed didn’t add much in the way of taste, probably because I picked it off and ate it on its own. Whoops. The allspice berry was probably the source of the chili almost-heat I couldn’t describe while the calabaza, a type of lightly sweet squash, accounted for the slight sweetness in the finish. These truffles have the smoothest ganache I have ever had the pleasure to experience, and their spherical shapes are gorgeous in a minimalist manner. I wish I’d picked something more adventurous than the Tlan Nacu, which turned out to be pretty tame, but the most of the other interesting truffles overlapped with the mini chocolate bars. At $3 a pop, the Vosges truffles tie with the imported truffles at Viva Chocolato for the most expensive truffles I’ve ever bought. I’d give them a hearty ZOMG! for being decadent, interesting, and well made, but I’m demoting them to an OMG because of the exorbitant price. I probably wouldn’t buy them again for myself, but I wouldn’t turn them down if I got a chance to pick out more next Christmas. You can also check out Cybele’s take on the Vosges brand at her site. 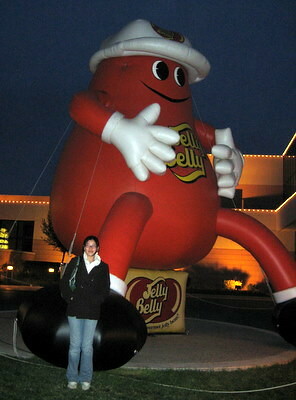 I have been wanting to take a tour of the Jelly Belly (BUY!) factory for years. I remember back when I was in middle school you could go to their website and, if your timing was right, get a free sample bag of jelly beans mailed to you. Now that they’re a beloved and well-established candy company, they no longer need to mail out free samples to drum up business. The people at the Jelly Belly Factory were so nice! We arrived at 3:15 to find a huge line winding out of the factory through those gates. I was worried that we wouldn’t make it in for a tour that day (the website said that tours are offered until 4:00, and we were dozens of people past the hour-long wait marker), but they reassured us that, if we were already in line, we would get a tour. We made it in at about 4:20, and there was at least one more tour that went in after our group. To make the wait easier, Jelly Belly employees constantly walked up and down the line handing out Jelly Belly samples. They had a special scooper that doled out exactly one jelly bean at a time. We got to taste a Very Cherry, a Kiwi, and a Pomegranate. I also visited the Jelly Belly sample bar (hooray for my parents, who held my place in line for me), where you can try everything they sell. Basically, you’re only limited by your shame. I tried a dark chocolate Jelly Belly (a sort of new flavor), a chocolate covered Sunkist fruit gem (not worth buying; the plain fruit gems are way better), an orange Jelly Slug (also not that great), and a lemon-lime Sport bean (super juicy!). And because I’m not a horrible daughter, I bought a little bag of buttered popcorn flavored Jelly Bellies for my patiently waiting parents, as that’s their favorite flavor. 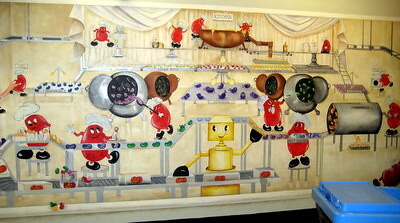 Alas, photography was not allowed on the tour, so you’ll have to be content with their painted representation of the Jelly Belly making process. The tour basically walks you through the factory (you’re overhead on a walkway that has window cutouts at adult and kid-friendly heights) as you watch the Jelly Belly employees work. Each stop has featured video that’s introduced by your tour guide. When we visited, the panning room smelled strongly of buttered popcorn Jelly Bellys with a faintly fruity undertone (Tutti Frutti, perhaps?). I asked our guide, Desmond, if it always smelled like that, and he said the smells vary from day to day as they change the flavors of beans that they’re manufacturing. At the end of the tour, we all got free mini bags of Jelly Bellys. My family also walked out with 3 bags of Jelly Belly Belly Flops (they were buy 2 get 1 free) in addition to the Bertie Bott’s and on sale Christmas candies I picked out for myself. If you’re ever in the San Francisco area, you should definitely make the Jelly Belly pilgrimage. It’s fun, and you get free Jelly Bellys out of it! I found the British Cadbury Crunchie (BUY!) at Coco Moka in Houston’s airport. 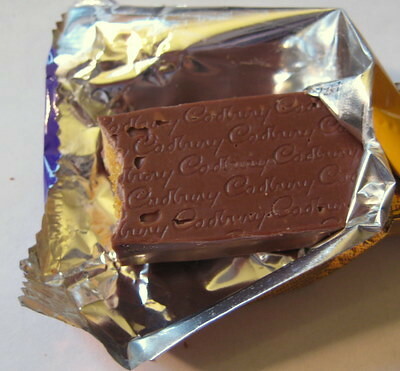 The wrapper promised “milk chocolate with a golden honeycomb centre,” so I expected that it would be something similar to the Violet Crumble, and I was right. However, I liked the Cadbury Crunchie more. 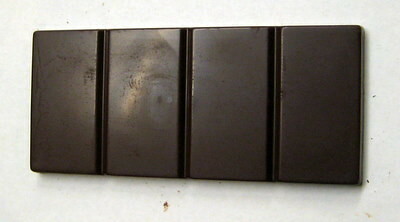 The honeycomb center (or centre) of the Cadbury Crunchie was darker and had a more complex burnt sugar flavor. It was also less styrofoamy than the Violet Crumble, so it was less dry on the tongue. 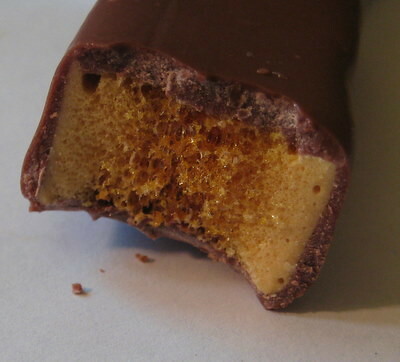 Despite being better than the Violet Crumble, the Cadbury Crunchie still falls far short of the chocolate/honeycomb perfection attained by the Dark Sponge of Economy Candy because its honeycomb center is that fake foamy thing. My first two bites made me want to give it an OMG, but a third bite put me in sweetness overload, so I demoted its ranking to an OM. Perhaps if I’d tasted the treat sized version (BUY! ), I would’ve let it keep that higher rating. Even the nice touch of the decorated bottom couldn’t change the fact that the sweet milk chocolate plus the dense and sweet honeycomb adds up to an overly cloying bar. Now that all the reviews have finally been published, I can share the ratings summary with you. The bars are ranked by my friends’ ratings, not mine. 7. Endangered Species Dark Chocolate with Cranberries & Almonds, 3.5, ZOMG! 11. 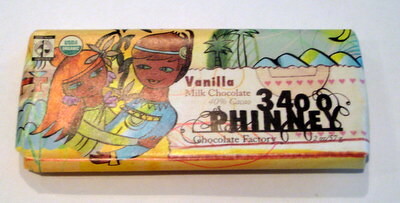 3400 Phinney Chai Tea Milk Chocolate, 2.67, ZOMG! I love, love, loved this bar. I don’t drink chai tea because I usually find it too sweet, but this bar was just right. Because I don’t drink chai tea, I had a hard time naming the spice flavor I got from this bar in my blind tasting. My notes say “great cinnamon-y(?) notes. Not sugary cinnamon; genuine, real cinnamon spice,” which is the best way I could describe that chai spice essence. Another friend mused that the flavor was like cinnamon but not quite and wondered if the bar had cloves. A little research revealed that chai spices can include cinnamon, cloves, cardamom, and star anise. So we were close-ish. Many of my friends didn’t really like this bar, and several of them felt the “weird” spice flavor overwhelmed the chocolate. I found the flavor intriguing, and it kept me reaching for more pieces. Like all the 3400 Phinney bars, this too was smooth and creamy. A ZOMG! from me because I couldn’t stop eating it. It was my favorite of the 3400 Phinney bars and probably the only one that I would regularly buy for snacking (if I could afford it; at $3.25 a bar, these don’t come cheap). Amongst my friends, this came in 11th out of 13 (just one spot above the Dagoba Chai) with a score of 2.67/5, so it’s not for everyone. I was quite impressed with Theo’s 3400 Phinney line, and it doesn’t hurt that they’re all made with organic and fair trade ingredients, though that does drive up the price. I’d love to taste the other 3 varieties. Cybele from Candy Blog reviewed all 6. This milk bar had a European/Cadbury-finish which I found to be quite good. The melt is smooth and the mouthfeel creamy. I thought I tasted hints of bread or toast, but my palate is untrained, and it also may have just been the power of suggestion (I knew one of the bars would be the bread & chocolate). The bar looks pretty dark in the photo, and it’s not just a trick of the light. 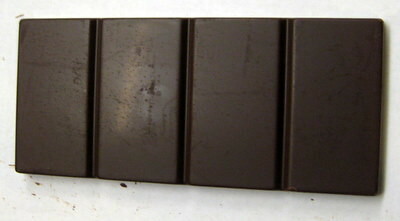 40% is a high cacao content for a milk bar, and many lesser chocolate companies would try to pass that off as a semisweet. I thought this bar was wonderful for a “milk” bar, and I thought the sweetness level was just right. An OMG from me, and a 3.71/5 from my friends, making it good enough for 4th place at my chocolate tasting party.